Have you heard about Bow Nail Polish? It's a newer brand out of Russia created by the creative director of Dance Legend polishes. The polishes are not part of the Dance Legend line, but rather a separate brand in 11ml rectangle bottles. On launch last year, the brand released three collections of six polishes, NeoNation was one of those collections. 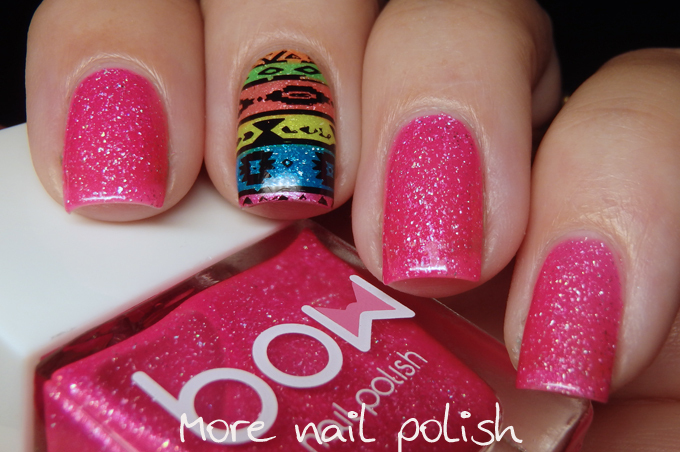 The polishes in the NeoNation collection are all neon jellys with a scattered holo flakes and a complementary shimmer. On their own you need three coats to get full coverage, and with three coats they have a lovely depth of colour. Being neons they also dry to a matte or semi matte finish, so you will need a shiny topcoat to bring out the best in the holo shimmer. 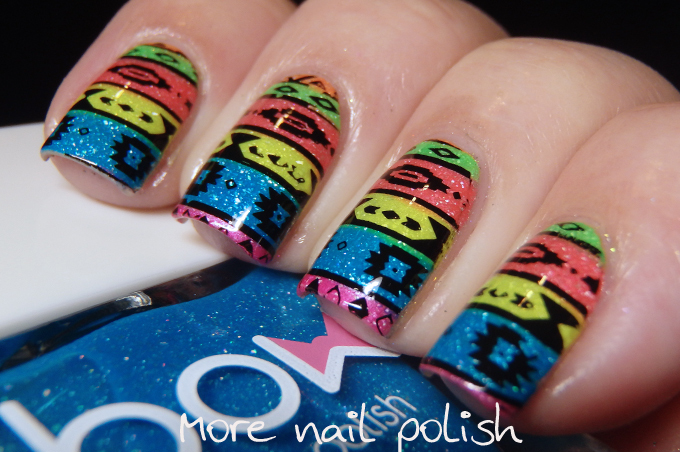 I wore all these polishes together in the neon tribal pattern, created by using the advanced stamping technique on clear jelly stampers. Let's look at each of the shades a little closer. My photos are taken under a desk lamp, as unfortunately I've been working too much and haven't been able to swatch during normal daylight hours. All the polishes are a little brighter in real life compared to my photos. Breathe Life - Bright lime green jelly with a golden shimmer. Doll Everyone - Neon pink jelly with scattered holo and a golden shimmer. First Light - neon yellow jelly with scattered holo and golden shimmer. Means a lot to you - Coral jelly with a scattered holo and pinky shimmer. Feet in the ocean - neon blue jelly with scattered holo flakes and a blue shimmer. The formula on all these was consistant. Thin and quite sheer to start with, but buildable at three coats for full coverage. Here are all the Dance Legend links for your shopping enabling and social engagement. Wow! I think I need those polishes! I love the bow brand! The have some really gorgeous colors. I said that I would get all the thermal tc then the others. However, I have to deter from that momentarily to get dark days.